When my middle son was seven, he knocked it out of the park with the first video he created. Back when Rainbow Loom bracelets were hot, he put together a tutorial on how to make a certain type. Within three days, his video received 70,000 views. He also received quite a few nasty comments. He was seven, after all. He’s 12 now and hasn’t been able to replicate that success since. He figured out what many already have about video. Getting started has never been easier. You can be on camera in minutes by using the equipment you already have — your smartphone. Having success with video? Now, that’s another story. If you spend time and effort creating videos, you want to see a return on that investment. You want to grow your audience, increase engagement, and generate new business. When done right, video can help you reach your goals. We are all video watchers. We go to YouTube to discover how to make a cake in a cup (delicious, by the way) and how to create budgets in Excel (I did that last month). When you watch a compelling video, you feel like you know the person (or people) on the other side of the camera — and sometimes you spend large amounts of time browsing videos created by your favorite people. How can you generate that kind of response when you create videos? Let’s look at three simple keys to a successful video strategy. People choose businesses they know, like, and trust, and video is a highly effective way to create that connection. Before you connect, though, you need to attract the attention of the people you want to reach. Educational. What does your audience struggle with? What frustrates them? How can you help them achieve a desired result? Inspirational. Stories that pull on your heartstrings are often the ones that also inspire you to take action. Try case studies about significant client successes. Entertainment. Make your audience sit up and take notice with surprising features or humor. All of these video types present opportunities to spotlight your personality. Cornerstone content helps visitors to your website or blog know exactly what you do and how you can help them. You can start creating videos for your business by turning your existing written content into short videos. Then you can rotate through educational, inspirational, and entertaining topics on a consistent basis to fill out your video publishing calendar. And set a regular posting schedule — weekly, bimonthly, or monthly. It gives your audience the chance to look forward to your upcoming content. Not everyone will agree with this, but I stand by this step. I think a script is necessary for video success. You don’t have to script every single word, but mapping out the plan for your video helps you get to the point faster. Within the first 30 seconds, explain the transformation your audience should expect, so your viewers immediately know the benefits they will receive if they keep watching. When creating a script, focus on the elements that make up a great story. A great story always has a clear beginning, middle, and end. Wrap up the video with a recap of what you talked about and a call to action, whether it’s subscribing to your YouTube channel, signing up for your newsletter, or contacting you for a consultation. Behind the scenes. Take your audience to work with you. Find parts of your job you know your audience is interested in and show them what you do. Interviews. People feel so much more comfortable on camera when they are in conversation. When you conduct an interview, you introduce your audience to another individual. When you’re an interviewee, you share your message. Tutorials. These “how to” videos share the knowledge your audience needs. Your audience will look to you for the latest information in your field. Through your videos, they also learn about the benefits of your products and services — and may contact you if they need your help. The more videos you create, the better you will get. The better you get, the more confidence you have. And once you have more confidence, you will enjoy creating videos on a regular basis. It takes work to get to that point, so batching your video production is an effective and efficient way to stay on top of your schedule. I host a local TV show and we batch our shoots every four or five weeks. We book a space for the shoots, our interviewees join us there, and we shoot six segments, one right after the other. We finish in less than three hours. Getting a space ready for a shoot, setting up your location with lights, and even getting camera-ready (makeup, hair, clothing) takes time. Setting up for a shoot once every few weeks, instead of when the spirit moves you, saves time and energy. How can you engage your audience? How will you produce videos regularly? What’s the goal of each video? My son is now asking himself those questions. He’s thinking about his audience more, and he’s aiming to create videos on a consistent basis. He didn’t always want to put in the time, but it’s the only way to ensure his first successful video won’t be his last. 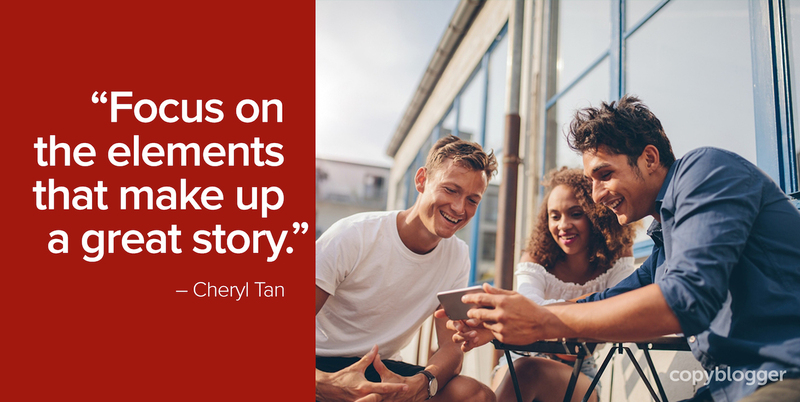 Cheryl honed her content marketing strategy skills in Copyblogger’s Certified Content Marketer program. It’s a powerful tool that helps professional writers position themselves for greater success. Want to enroll? Add your email address to the waitlist below to be the first to hear when we reopen the doors to new students for a limited time soon. Cheryl Tan is a 20-year veteran of broadcast news, and currently advises companies on video marketing and PR. She's the creator of the STANDOUT with Cheryl Tan podcast and is also one of Copyblogger's Certified Content Marketers. Join Cheryl's free community for business owners and content marketers here. We are not all video watchers. Reading a transcript will always be much, much faster. The written word certainly creates a different kind of connection. I will agree with you. I enjoy transcripts that are included with videos. Michael: And some are audio listeners. 😉 You could speed up the voice(s) on several of the podcast apps, e.g., OverCast. Wonderful, Martin! Let me know if you have any questions as you get started. I like the tips Cheryl. Good to see your son is off and running in the video creation game. Awesome for him. I create live videos on Facebook and Periscope daily. Love the vibe of doing this stuff in the moment, live, no scripting, because that is how my personality flows and that is also how I am becoming more of a natural on video. Gotta do it live to let the real you flow through your work. Fab advice here. Thanks so much, Ryan! Congratulations on your video creation. Yes, the more you create, the more fun it becomes. 4. Create a transcript of the video. Not only is it quicker to find the info you want with a transcript (and better for search engine spiders), its also useful to visitors who cant play sound / wear headphones. It drives me nuts when i’m looking for something specific at work and the blog i land on turns out to be video only. Very good point, Steve. To be honest, a transcript would be helpful for the creator as well. When you create so much content, it’s hard to remember all that you have already put together. WOW! your son really nailed it, means at 7 who normally does that. Indeed video now days is more preferable than going through the long textual post for getting something fetch into our brains. This hybrid world loves to watch videos and surf through youtube for their related query. I am practicing my self to present before the cameras, as I practiced daily for an hour delivering my stuff over through here. Thanks for the amazing tips. Shantanu, I love that you are practicing – and that you are creating videos. Make sure you hit record and watch them later. You will be amazed, and pleased, by how far you have come. Congratulations! Love your tips about YouTube. I always use a script for creating video. It helps to stay on topic which in turn, keeps viewers more engaged. Many people tend to wait until they get all sorts of fancy video equipment, and as you pointed out, using a smartphone is really all you need. I am so glad you brought up the point about attracting the attention of your audience. Too often I see content creators just creating what is near and dear to them instead of finding out where the interests of their audience is. It makes a huge difference when you cater to your audience. Great tips and I thank you for sharing! Cheryl love the article. I spend at least 30 minutes a day on YouTube following ‘the gurus’ in my field. If I can get at least one idea a day ( and put it into action) the ROI is unbelievable. I have just now begun creating content, so your tips highly valuable;e. Thx. Thanks, Keith! I love the system you have in place. And I think it’s smart that you put a focus on the action part. Good luck on creating the content that will be so valuable to you in the future. I have been banging the drum about video content for a little while now, because businesses (especially within the tourism industry) under-estimate its potential. They assume that you need to create high-end, professional TV quality video on platforms like YouTube. What you need is a good story that is going to catch people’s interest, be personal with your audience, be consistent with when you upload and optimise the videos for search. Great article! Great tips. Of course not for everything but video has definitely replaced written content when it comes to certain markets. Just finished watching some cooking shows on Youtube and their bits were just as professional as network TV. Just like to add that you can use annotations with Youtube videos to get the best of both worlds and helps a bit for SEO’ing videos. So true, Sarah! Thanks for the tip! Thank you, Lisa! Good job on your videos!